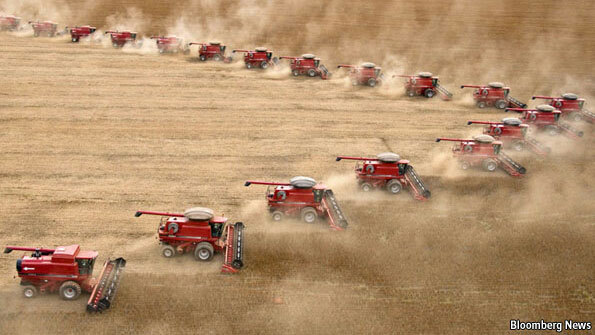 Agriculture in Brazil – How to Feed the World? “First, I would like to say that my critics are not as simple as saying “industrial farming is bad!”. It is much more detailed than that and the problems (not) raised by the author are much deeper. Unlike he says, being opposed to his comments is not saying “organic is beautiful”, it is more complicated than that. My critics will be linear. The first part implies a shallow critic to subsidies for agriculture, among others, in Europe for instance. The author ignores or clearly does not know what would be the state of Europe’s countryside if subsidies did not exist, in terms of landscape and human life conditions. Subsidies in Europe protected farmers from being rejected from their own profession by economic and market laws. It is one of the rare professional fields that indeed cannot be totally submitted to international market laws without being totally changed in its structure and justice. Of course I am not saying that there is no abuse of these subsidies and that their use is not sometimes dishonest but without the CAP (Common Agricultural Policy) in Europe that guarantees subsidies to a lot of farmers, the main part of agricultural properties would have died (most of Europe’s agriculture is made of family farms) and its agricultural market would be even more dominated by industrial and multinational lobbies. Family farms cannot compete with multinational production (meaning huge farms in the US, Brazil, Argentina, Russia, etc. led by companies like Monsanto or Bayer) without subsidies, unfortunately. And lots of farmers would really prefer to make a living only of what they produce and not also of what they receive. The second part of the quote is obviously shocking: not protecting the people who feed their own family with their small property, and letting “inefficient farms” die, that is admirable, indeed. Who wants to give a standing ovation to that? The author certainly forgot that 85% of farm producers in Brazil are small and family producers. They account for only 25% of the land used for agriculture but they supply 70% of what the Brazilian people buys and eats IN the country . Please, let go to the wall 85% of the people who work to feed you. Come on. Next, the author presents the “agropessimists’ prescriptions” as he calls the people who are, to me, aware of the world’s agricultural stakes. In his listing, one can feel the critic of his tone. So does the author think considering sustainability as a main virtue, encouraging small farms, thinking it is more important to sell products on a local market than to export, is ridiculous? It seems like it and if it is the case, he gives the impression to live 50 years ago. Has he forgotten that producing and selling on a small scale is the work and passion of millions of people? Has he forgotten that sustainability is a virtue we cannot live and see a future without, nowadays? Has he forgotten the environmental damage of large scale production and exporting business? On the contrary, I am not saying producing on a large scale and exporting is not important: thousands of people work in this field, meat production would not be able to supply our demand (I am, myself a huge carnivore), and it empowers countries. That is good, but as in every subject, making the balance shows your knowledge and your wisdom. On this theme, how is it possible to forget such a large amount of things? I do not think the author ever questioned himself about what sustainability is. One’s business is not sustainable depending on the existing amount of the things one uses, but on HOW one uses them. Land and water are, indeed, HUGE resources in Brazil. But the big farms that use them are far from being sustainable. These resources look endless in Brazil but they are not. It is not because the resource is abundant that you can use it without counting and be sustainable. What makes your business sustainable is your capacity to preserve it, use it the least you can, reject it clean, even though it is abundant. Economically, these farms are, for now and yet a long time, sustainable. Environmentally, I will not even comment, I will just say that the themes of pesticides, GMOs, the use or not of ploughing, monocultures, certified and patent seeds could be discussed in relation to this article but it would be too long and it opens a huge debate once again. And socially, once more, the author ignores, forgets, a great problem present in Brazil for decades. The multinational farms installed for a great many of them in Mato Grosso, Mato Grosso do Sul, Bahia, Goiás, São Paulo, have literally colonized Indian lands, sending the populations to live out of their original homes, concentrated in some areas, in more than dark agreements between who knows whom… Very often, these people, work in these farms, barely paid, and totally submitted. Unfortunately they don’t really have the choice and trying to complain is dangerous. The power of the new land owner is so big that bothering him in his business threatens your life. The symbol of this danger is the former environmental activist and seringueiro producer (amazon tree cultivated for its sap) Chico Mendes who was killed in 1988 by big farm producers. A long time ago, but we don’t forget. If this is sustainable for the author I don’t know where he got his definition. The author gives various reasons to admire the “Brazilian agriculture” (reminding that he includes only 15% of producers of the country). This agriculture is efficient and productive. It is true. In the field of cotton, soya, sugar cane and more, these farms are fantastic in terms of technologies, yields and costs of production. No wonder no one can compete with them. It IS a miracle, technically. I do not deny this. But reading Africa should take Brazil as an example was the biggest shock for me. The rob of some peoples’ land is already happening in Africa and applying the Brazilian example could of course make its farming produce economy skyrocket but would also have disastrous social, environmental and local economic consequences. When locals of African cities buy imported rice from Brazil (with which local farmers cannot compete because the cost of Brazilian large scale production is so low that even imported rice from Brazil can be cheaper than local rice in Africa) or start to buy locally produced rice on the example of large Brazilian farms, they will not buy local rice coming from small scale agriculture anymore and its producers will stop their activity and make the slums of the cities grow bigger and bigger, unfortunately for them and for the common good. This is already happening with farm produce from the giants of agriculture like Brazil and the Brazilian way of farming is far from “being more likely to do good in the poorest countries of Africa”, if one cares about the rural population of course. Last but not least, the author tackles the accusation that is classically made about Brazil: Brazil destroys its Amazon forest. He recognizes that it has been the case and adds that “most of the revolution of the past 40 years has taken place in the cerrado, hundreds of miles away”, precising that in this way, there is no “need to touch the natural wonders”. That is true, but that is not the problem. Saying this, the author contributes to the common image that the cerrado is a dry, unfertile and useless landscape. This is ignoring that the cerrado is a whole ecosystem in itself with a generous biodiversity. Of course we are not talking about beautiful parrots or monkeys. We are talking about thousands of native plants, 1200 species of fish, 837 species of birds, 180 species of reptiles, a large number of insects. A lot of these species are endemic to the cerrado. Without forgetting that the cerrado contains 220 species of medicinal plants and more than 10 species of fruits that are all regularly used and consumed by locals. The fruits are also consumed in the cities of the country. Indians communities and quilombolas (communities of descendant of slaves that fled and created quilombolas) are present in this ecosystem and have a traditional knowledge of all its resources. So of course, extending the agricultural frontier in other spots than in the amazon is a good thing but let us not say that it does not destroy ecosystems that are rich and contain the resources that permit populations to survive. The cerrado is maybe not a natural wonder to the common eye, but it is to the eye of thousands of people who give value to such a rich ecosystem or to the eye of people who also give it a practical value and for whom it is a source of nutrients and cures. These are my critics to this article that was published 3 years ago. I will just finish by reminding also that the producers included in this article, for a lot of them, do not produce food for humans. The title “How to feed the world” is just funny, ironically speaking. An important part of these lands are used to produce soya for European farm animals or sugar cane to provide the cars in São Paulo or Rio de Janeiro, among other crops of course. Posted on November 6, 2013 by saynotofoodwastePosted in BlogTagged agriculture, food, food security, hunger, land misuse, sustainability.